This Saturday is the eighth Non-League Day, the opportunity during the international break for football fans to take a fresh look at the grassroots version of the sport. There are more than 40,000 semi-professional and amateur sides in England. Most of them are run by volunteers with sides full of players driven by a genuine love of football rather than the megabucks of the professional game. It is football in its purest sense and takes place on pitches up and down the country. Chances are there’s one by you. If you give it the chance, you’ll find the games – while undeniably lacking the quality of top-level football – certainly do not lack the passion and are, arguably, more exciting. You might spot players you recognise at the end of their careers. You’ll maybe see players who will be household names in a few years. But above all you’ll see players playing for the love of it all. This Saturday would be a great opportunity to shell out just a few quid and go and see a full-blooded clash between two sides. 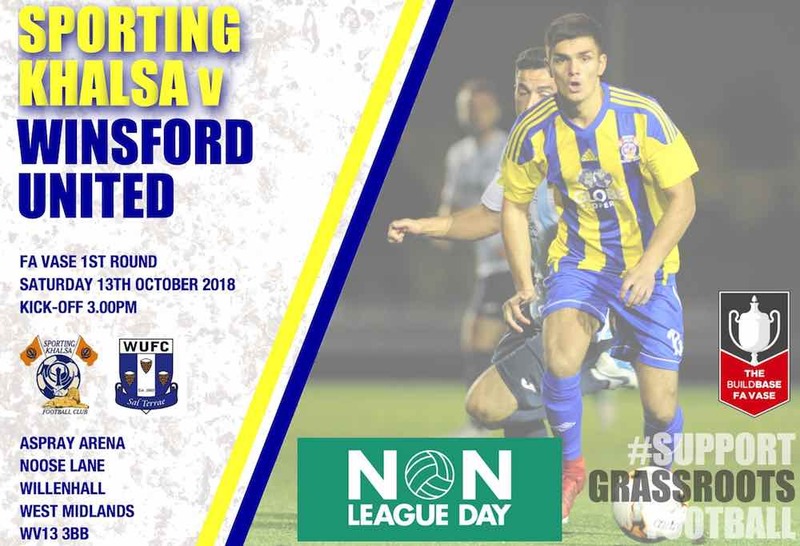 Sporting Khalsa have what is a special game for us, an FA Vase First Round clash with Winsford United for the first ever meeting between the two sides. Winsford are based in Cheshire and play in the Northern Western Counties premier division and currently sit in 19th place, joint bottom of the league on goal difference. Their most recent result was at the weekend when they lost 2-0 at home to Ashton Athletic. In an attempt to kickstart their season, a flux of new signing were made this week with Kyle McGongile, former Manchester City youth player Joe Thompson and ex-City and Crewe right back Callum Bullock. Winsford have one particular clear and present threat in the shape of Peter Watling who has bagged six goals already this season. For our part, Khalsa have won eight games on the bounce and in the last six matches have plundered 29 goals, including seven in Tuesday’s Walsall Senior Cup clash with Eccleshall. If you’re not familiar, you can meet our players (some right characters) here. If that hasn’t tempted you to give Ikea a miss and come and watch some football with a pint, we don’t know what will. We might be bragging ever so-slightly, but most people who visit the Aspray Arena agree the food and drink on offer – in the ground and in our legendary 442 Bar and Lounge – is among the best in West Midlands non-league. It might be you haven’t visited since our ground underwent the revamp and reopened in the summer – what better time to give us a try? We’ll be joining in the spirit of the occasion by holding a raffle for the Non-League Day charity, Prostate Cancer UK.